EDL News, etc. 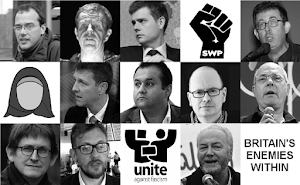 do not include the Conservative Party in that huge list (Hope Not Hate also has a very large one too) because that would backfire (though in the 1980s and after it too was class as "fascist"). If they did, that would display their Leftist extremism in too obvious a manner. Besides which, there are just too many Tories in the UK and the Tory Party has both the money and the political power to cause these groups serious trouble. No. First get rid of the groups above, then refocus. God know what this country would be like if these people had political power outside the universities, rights groups, parts of the law, etc. It would be a giant Gulag. Hundreds of thousands of British people (probably millions) have views which Gary Hastings believes shouldn't be expressed and whose chosen political groups should all be "proscribed" (as he and Hope Not Hate put it). 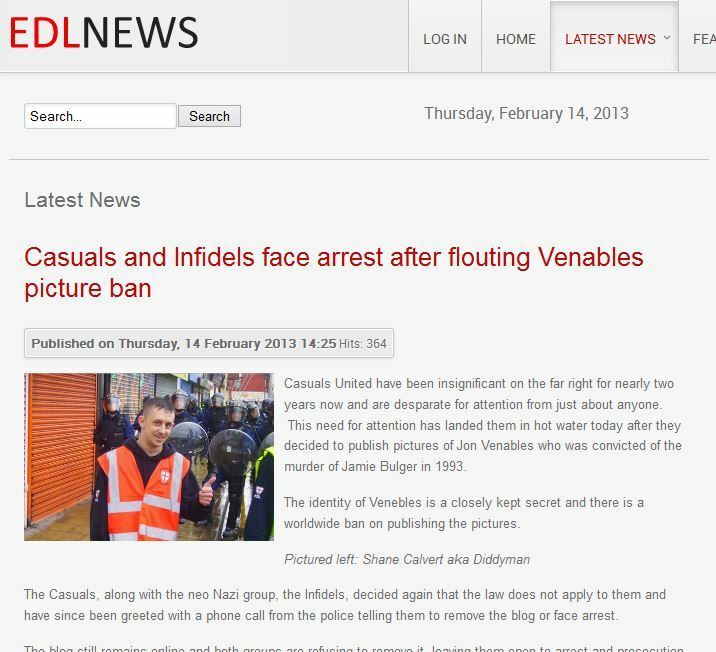 The EDL News blurb says that “we at EDL news are not associated with any political groups, or affiliated with any political parties”. That depends on what is meant by “we”. That “we” could be as little as two people. In fact Gary Fieness Hastings may well be using the “royal we” here. I think that could well be the case. Even if there are other writers (I counted only one), that will still probably mean that Hastings runs the show and other people simply send stuff in. The loose language is terrible – but deliberately so! EDL News is “not associated with any political groups”. What does that actually mean? Does it mean that they have no official connections or that people on the outside haven't associated EDL News with any political group? None of this means anything. It doesn’t mean that Gary Fieness Hastings is not a member of any of these groups. It just means that EDL News is not an official organ of any of these groups. That’s all! It also probably means that disassociating themselves from these groups helps the cause. However, Gary Fieness Hastings should try harder with his pretense because he’s always posting links to the Communist-run (literally!) 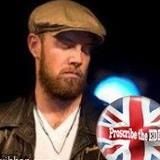 Hope Not Hate/Searchlight. There are also the words “collectively we are neither Muslim, Christian”, etc. Again, that depends on how many people run EDL News. If only Gary Fieness Hastings runs it, that collectivity doesn’t really amount to much. It’s hard for one person to be Christian and Muslim at the same time (even for a member of the Church of Interfaith). The blurb also states that the “website exists to expose the darker side of the English Defence League”. Does that mean that EDL News believes there is a lighter side to the EDL which is being ruined by its “darker side”? Of course not! It’s just weasel words from Gary Fieness Hastings. To him, the entire Right, not just the “far right” (hence the latest major target – UKIP!) is one big “dark side” to be annihilated by red fascists like himself. And then we get the “sinister side” of the EDL. Gary Fieness Hastings, tell me about what you see as the non-sinister side of the EDL… or UKIP for that matter. EDL News says that the police will deal with Islamists and groomers' not the EDL. Apart from the fact that the people in EDL News have tried to stop the police from doing anything about these problems, is this the same police that these red fascists otherwise hate with a venom and have done since Year Dot? Gary Fieness Hastings really is a spinner of incredible deceits. He even has the anarchist Malatesta Blog on his website. So what’s with this Leftist taqiyya about the police, eh? The blurb also says that Britain is “a county built on immigration”. Yes. No one can doubt that – it’s true, up to a point. But which immigrants are we talking about, exactly? The Islamists and terrorists who hate our country and use their benefits-given-free-time to plot and destroy it? What about the grooming gangs which exist in almost every Islamoghetto in the UK? Surely there are good immigrants and bad. In any case, it’s not all down to immigration. Terrorists and plotters, even if native born, should be dealt with accordingly; not patronised by Trotskyist lawyers like Gareth Peirce. So Gary Fieness Hastings should stop using positive stereotypes and positive generalisations about all immigrants. As for race, it’s the Left that has a fetish for that – as they did for class in the old days before they started patronising blacks and now Muslims. The blurb ends with the absurd words “proud to be British”. EDL News is not run by patriots (or by a single patriot). It’s a false flag. Ask Gary Fieness Hastings what he means by being a patriotic Brit and he will probably tell you about those Brits and aspects of Britain he likes: Tony Benn, Gareth Peirce, Hope Not Hate, Arthur Scargill, Ken Livingstone, Rock against Racism, the Clash... whatever. But liking things that are British doesn’t make you a patriot, Gary Fieness Hastings. If it were as simple as that, liking the English Nazi Party would make you a patriot. Ask this man exactly what he means by patriotism beyond the nice Leftist and PC aspects of Britain. How can a he be a patriot when his Leftist and Islamist friends want to destroy this country? These Islamists explicitly state this. So too do many Leftists; the very same ones who hide behind this false-flag patriotism. 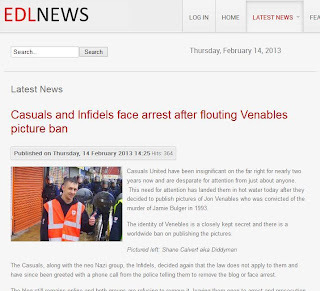 Finally, does EDL News really stand against racism? It doesn’t stand against the anti-white racism of the red fascists; or against the massive Jew-hatred of the Left. And not against the inverted or positive racism of that very same Left which treats all brown people/Muslims as children without free will or morality who function simply as people to be condescended to by white middle-class Leftists. That, my friend, is one big litany of racism. And what about the massive racism of Muslims towards whites, blacks and Jews? What about Islamic Arabocentrism? This is a Leftist silence on all racist beliefs and acts which aren’t believed or carried out by white people. That’s a Leftist racism imposed upon other racisms.